You can use the Menu to launch programs and to initiate many administrative functions. Simply click on the KDE Menu launcher to pop up the KDE Menu. To launch OpenOffice Write, for example, click KDE Menu => Applications => Office => Word Processor. Other programs can be launched in the same way. Figure 1: Use the KDE Menu on the left end of the KDE Panel to launch programs. Some of the other options available from the KDE Menu are access to your Home folder, and Help (the little life ring). The Actions section provides access to settings and to the print system configuration. There is also an item that shows the most recent documents on which you have been working and allows you to select those for immediate launch without searching through your folders for them. The KDE Menu icon looks like that shown in Figure 2 but depending upon your choice of icon schemes and your distribution, your KDE Menu icon may look different from this one. It will most frequently be some variation on the “K and Gear” motif. To navigate the KDE Menu, first click on the KDE Menu icon on the far left of the KDE Panel; this raises the KDE Menu. Use the tabs across the bottom of the menu to select the different categories. Then click on the sub-category in the main window of the tab you selected. After you have selected a sub-menu you will see a vertical bar which contains and arrow pointing left located on the left side of the menu window. Click that bar to move back “up” the menu structure. There are five tabs on the KDE Menu. 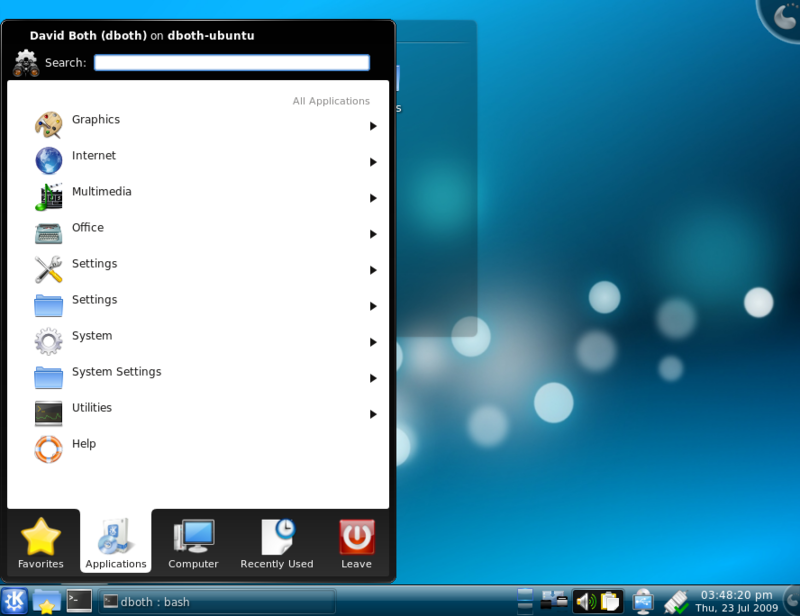 Each tab contains sub-menus of applications that are in some way related. The favorites tab contains a few launchers by default, but the specific ones may vary by distribution. The default launchers are usually for the Konqueror or Dolphin file manager, the System Monitor and the Amarok audio player. You can add new items to your favorites and delete ones you do not want. Click on the Add to Favorites menu item and the selected launcher will be added to the Favorites tab of the KDE Menu. You will also be taken to the Favorites tab automatically when you click on the Add to Favorites menu item and from there you can launch the program. Note that the original launcher remains in place; it is not deleted or moved. You have created a new “link” to this launcher which now appears in the Favorites tab of the KDE Menu. The Applications tab of the KDE Menu is a hierarchical menu structure of the applications installed on your computer. Navigate through the Applications sub-menus to locate the application you want to launch and click on its launcher. The Computer tab contains launchers related to your computer. There are three subsections to this tab, all of which are visible. Figure 3. The Computer tab of the KDE Menu contains items directly related to configuring and navigating your computer. The top sub-section is Applications. It contains a single item, System Settings in this example from Kubuntu 9.04. On my Fedora 11 system it contains System Settings and System Information launchers. The center section contains launchers for folders or locations to which you frequently navigate. Just click one of these launchers to open that location in the Dolphin file Manager. 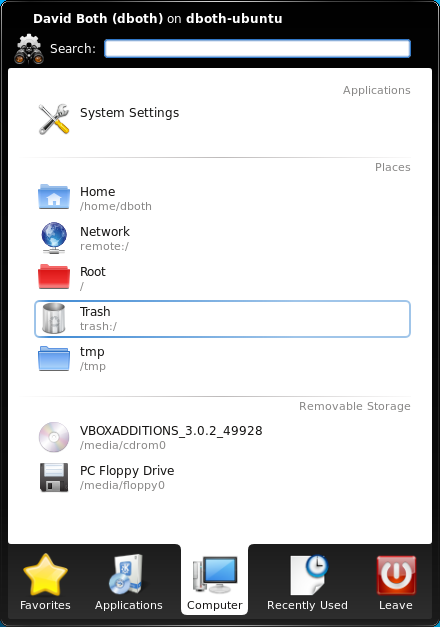 This section starts with a few default locations such as your Home folder (directory) and the Trash can. Others are added as you use Dolphin to navigate to them. The bottom section contains launcher icons for removable storage devices. Click on one of these launchers to open that location in the Dolphin file Manager. Launchers are added and deleted as mass storage devices such as USB thumb drives or external hard drives are inserted and removed. In the Leave tab there are also options to lock your current session, logout, and even to switch users.